Great Pskov is part of the Tentative list of Russia in order to qualify for inclusion in the World Heritage List. Part of my Russian experience was to ride a night train once. I did some digging and found that Pskov was a good destination on my way from Moscow to St. Petersburg as it also allowed me to visit Novgorod along the way. Admittedly, the experience was rather boring as all the Russians on board of the train wanted to sleep and I ended up drinking the beer I bought on my own. In any case, I made it to Pskov and found a pretty Kreml (or Krom as they call it in Pskov). The weather was gorgeous and I had a nice time visiting and wandering around the city. Not to be missed is the Mirozhsky Monastery on the other side of the river. 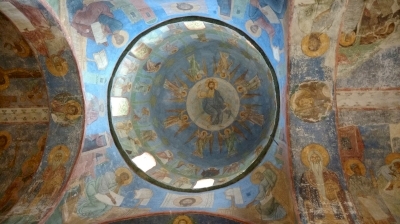 The 12th century artwork by a Greek/Byzantine artist in the chapel is astonishing and survived the Mongols. To me these together with those in Suzdal were the best wall paintings I have seen in Russia. This would be yet another Russian Kreml plus orthodox monasteries. But maybe it's the clear Baltic influences on the Krom or the good state of preservation: I actually think this should be inscribed. It may not be Talinn, but it certainly is nicer than nearby Mir Castle. And the artwork in the Mirozhsky Monastery is just stellar outshining nearby Novgorod easily. I took a night train from Moscow (I think Kalanchovskaya). We arrived in the morning at the train station on the outskirts of town and I walked into town. From Pskov I continued on by bus to Novgorod in the afternoon. There are also direct buses to St. Petersburg. Another option is to cross into Estonia. I think there are direct buses to Tartu where you can visit Struves home university. Around Pskov on the border with Estonia you find Lake Peipus and the Pechory Monastery. The Pechory Monastery is known for its "eerie burial chambers". I did not make the trip.